PBR will be showing all the action of the highly anticipated UFC 200. The landmark fight, from the undercard matchups through to the rematch between Daniel Cormier and Jon “Bones” Jones, takes place right down the Strip. PBR will offer two drink tickets, along with a guaranteed seat, for $75 during the fight card. General admission is $50 and standing room only. During the 2016 Home Run Derby and All-Star Game, guests at PBR who show up decked out in their favorite professional baseball team’s gear will get one free 16 oz. featured draft beer. 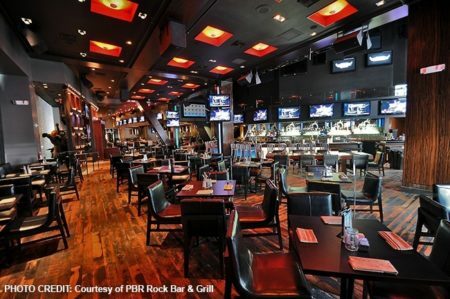 Catch all the action from San Diego as the 87th All-Star Weekend gets underway, featured on some of PBR’s 105 HDTVs and projection screens. A BBQ sauce base smothered in mozzarella and cheddar cheeses, topped with PBR’s house-smoked beef brisket, onion and jalape?o. In July, guests will enjoy $1 off featured draft beers, $25 buckets of five Coors Light bottles and a $30 open bar option on Coors Light and Blue Moon drafts. This month, when you show us any ticket stub, credential or proof of attendance to the amazing events happening in Las Vegas, you’ll get 15 percent off your bill. Events that qualify include Britney Spears and Jennifer Lopez at The Axis at Planet Hollywood and Paul Zerdin at the PH Showroom at Planet Hollywood, among others.